Make them filled, or just regular old doughnut shape, and you won’t regret it. Let me tempt you with some photos of today’s batch: rhubarb compote filled and milk chocolate filled (and a few rings for good measure). 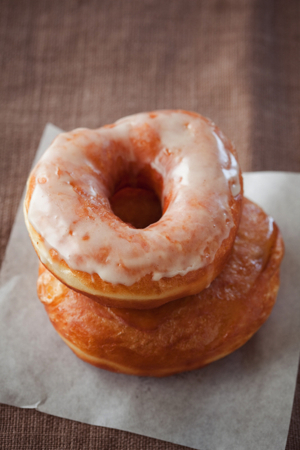 PS: On the whole doughnut/donut debate… they are both correct! So feel free to use either one. Donut definitely works better on twitter! 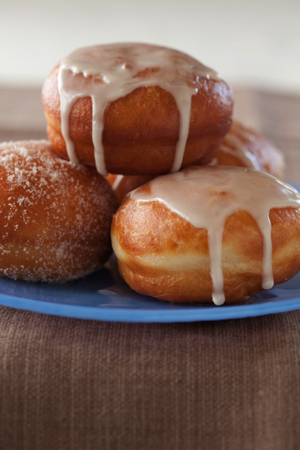 This recipe is adapted from these luscious looking doughnuts on Australlian Gourmet Traveller. I didn’t have buttermilk, so I substituted whole + a bit of vinegar (champagne citrus for just a hint of lemon). After playing around with a lot of raised doughnut doughs, I’ve also found that they work better with a touch more yeast and a bit less flour, so I’ve adjusted those quantities here. I fry my doughnuts on the stovetop with canola oil in a Le Creuset Soup Pot. Any cast iron pot will work, but ones lined with enamel will help keep your oil longer. I haven’t yet tried baking this dough, but if you want to try it, roll in another 1/4 cup of butter to the dough as you might if you were making puff pastry after the first rise, and let rest again before rolling out to cut them. You’ll also want to brush them well with a milk/egg wash to help them brown up. Stir together the yeast, milk, vinegar, sugar and ¼ cup warm water (105F) in the bowl of an electric mixer and stand for 10 minutes or until foamy. Add 1/2 of the flour and stir with a wooden spoon until there are no more dry clumps. Then, stir in the butter, eggs and a pinch of salt and mix with a dough hook until smooth. Start adding the remaining flour about 1/4 cup at a time allowing it to completely incorporate before adding more. When the dough starts pulling away from the sides of the bowl, do a quick touch test… the dough will be very soft and moist, but it shouldn’t come off on your fingers. Keep adding flour a little at a time, completely integrating it before adding more, until this happens. You may not use all the flour at this point. Let the mixer knead the dough for about 5 minutes. Test the stickiness again, adding more flour if needed. Then turn out on a lightly floured surface and knead by hand for one or two turns. Place in a bowl, cover with plastic, and let rise in a warm spot for about 1 hour. It should double in size. Turn out the dough onto a lightly floured surface, and roll to a little thinner than 1/2 inch (if making filled doughnuts) or 1/2 inch if making rings. Turn the dough 1/4 of a turn after each roll. Cover the dough with a towel and let it rest for about 3 minutes. Then, cut out the doughnuts with a doughnut cutter, a biscuit cutter or an downturned glass that has been lightly dusted with flour. 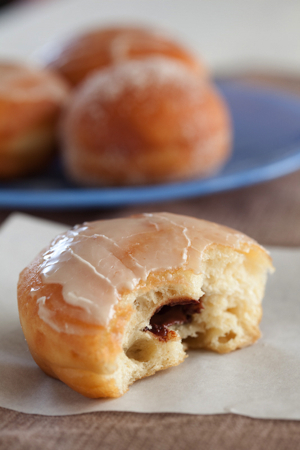 If you are filling the doughnuts, lightly brush a round with milk, and place about 1 T of your filling in the center. Top with another round and gently roll out turning 1/4 of a turn with each roll. Turn the round over, and using the same cutter you used before recut the round (this should trim off a small amount and seal the doughnut shut). Place on a lightly floured, non-terry dish towel and repeat with the remaining dough leaving at least 1 inch between the doughnuts. You may reform and roll any left over dough, but let it rest for about 3 minutes before rolling it out again. Cover with plastic and let rest in a warm place for 30 minutes. Heat the oil to 350F. Place one or two doughnuts in your pot at a time (depending on the size of your pot) and let cook for about 1 minute on each side. You’ll know when to flip them when the frantic bubbling dies down. Remove from the oil with a slotted spoon and drain briefly on a paper towel before cooling on a rack. Roll them in sugar while they are still warm, or allow them to cool some and drizzle or brush on a simple glaze (8 oz confectioner sugar + 2 T milk + 1 t vanilla is a good one). This entry was posted in Breakfast, Desserts, Food, Recipe, Sweet. Bookmark the permalink. If you plan to make doughnuts filled with rhubarb compote again, may I come over and help? I like to think of myself as rhubarb compote’s biggest fan. YUM. Nurit – Yes, I’d love to hear your cake one! I’ve been trying a lot of different doughs and batters… ideally finding one that will work for baking as well as frying. Laurie – Yes! Of course! hmm…. wanna have a donut … I love the idea of the filled ones! great pics! Oh my, they look fabulous. I’m just drooling over your pictures. I’ll definitely be trying your recipe soon.. Yum yum! can’t believe that DonutDay almost passed me by. those pictures look absolutely scrumptious. i almost didn’t bother to read the recipe, certain that they’d be WAY too complicated to make, but it all seems surprisingly straightforward. Alisa – Luckily for us, they were very real! Projectivist – Yes, doughnuts are far easier to make than I originally thought as well. And well worth it! This gal experimented with soughnuts too (I’ll be happy to translate if you want) http://room-4-dessert.com/heb/2008/12/doughnuts/ . As for the easy doughnuts with baking powder – I’ll look it up and let you know asap. … she tried different versions, including baking them. I made this recipe last winter and baked half the batch, since from my experience, if I don’t use 2 pots for frying simultaneously the later bathces’ dough gets “tired” and doesn’t rise nicely when fried, so I baked half the doughnuts and they were great. Not like the traditional ones, but still wonderful and guests that tried them loved them. They were more on the cakey side texture wise. I scanned and e-mailed you the recipe. These are truly fantastic looking donuts! I thought for sure they were storebought because they look so professional and delicious. I just bookmarked this page…I can’t wait to try these out! Hi, I stumbled upon your blog just last night… I find it to be a great blog! I love the photos and the whole website! This post is great! I have always wanted a good homemade doughnut, and I think I’ve found a great recipe which I will be making soon! 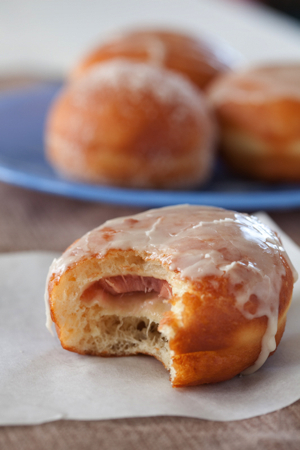 You are brilliant to think of putting rhubarb in doughnuts. Now, of course, I want one. Not fair. I’d love to make these doughnuts, but just want to clarify, is it a tea spoon or a table spoon of vinegar? cheers! Those donuts look fantastic! Which kind of camera do you use? I use a Nikon D200 for my food photography. I think your pics are amazing!! Beautiful doughnuts! I’m newly inspired to finally make some at home myself! Hi Projectivist – teaspoon. I use a capital T for tablespoon and a lowercase t for teaspoons in my recipes. Or, you can just use buttermilk in place of the milk and the vinegar. These look amazing!! I really want to make doughnuts now!!! I just have to say that your yeasty doughnuts look a lot like those down at the local bakery … Holt’s. Do you remember that place at all? I can’t wait to try this recipe, even if I’m a bit late to the party. 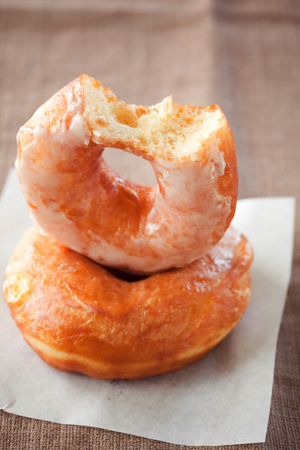 And I hear a donut cookbook is on the way…couldn’t be more excited! I remember my childhood “Donut Days” when my mother was preparing them filled with jam! Your donuts look scrumptious! I love the idea of doughnuts, especially the baked (and filled) ones. I’ll have to experiment!